Need a legendary website or app? Utah's top rated web development company at your service for a fraction of the price that most our competitors charge. We are Google top rated, Upwork top rated, Wealth Factory Accredited, and Featured in Business Q. We do Web Application Development, Website Development, Software Development, SEO, Mobile App Development, Conversion Optimization, Web Design, and More. Bright Bridge Web delivers top notch website development using the latest conversion proven and design standard html template patterns. With experience of developing over 182 sites, we have the talent necessary to help you create the site you envision at the best price. Build a Bridge to your Customers with a team of Award Wining, Wealth Factory Accredited, Upwork Top Rated developers. You could get a free consultation by simply contacting us now. We are confident that you will be very happy with the great results that will come from it. Feel free to checkout our website to see our vast portfolio of sites we have helped build for companies large (some of which you will likely know) and small (many of which have became very large now with their new sites). Here is a video about how we eliminate in-efficiencies in the this service space to get you the best services possible. We would love to hear from you about your project at the following email or on the contact form on our site so we can get back to you with a solid response and consultation and hopefully kick off your project real soon. I have worked here for a while, and its amazing to watch the teams and their passion for their projects. Toby @ BrightBridge is the G.O.A.T. The team aspires to do the best and goes above and beyond to deliver the website that you envisioning. Amazing people and with great values. WOW Bright Bridge Web ROCKS!!! I have never found a better group of web developers than the Bright Bridge Web team. They are extremely talented, make all deadlines on or before the actual date and they do all of this for a fraction of these other web development companies around. Bright Bridge Web is such an awesome place with an amazing work environment. This place is a major step up from my previous work. Such an awesome place helps me produce my best work and give my best effort. 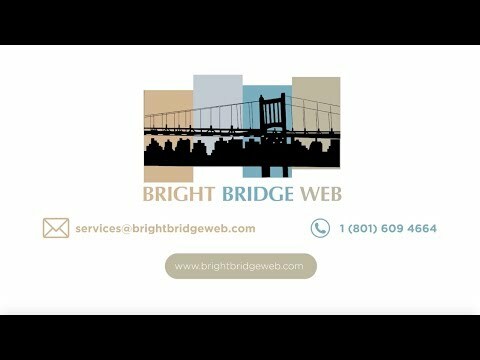 BrightBridgeWeb has exceeded my expectations, their communication was great, time estimates were realistic, and they were able to get the job done. Very professional company.